India: Gold prices in New Delhi have fallen after two days of substantial gains. The losses today were reported as part of a weak global trend across the world. Gold rates within India declined by over Rs. 80 to reach the cumulative price of Rs. 32,610 per 10 grams. This was witnessed amid easing demand from all local jewelers. Silver prices also followed the directions set by gold in this regard, and dropped by over Rs. 240 to reach the figure of Rs. 39,300 per kg. The decrease in silver prices is being put on poor off-take by industrial units. Gold rates within India had picked up by around Rs. 60 within the past two days because of the demand for the local Dhanteras festivities. 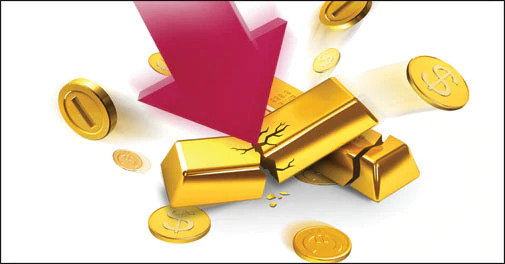 However, as the demand for Dhanteras diminished, the follow-up buying by jewelers wasn’t impressive; hence, the gold rates today got no support at higher levels and eventually fell down. Within Delhi, gold with 99.5 percent and 99.9 percent purity traded by less than Rs 80, at prices of Rs 32,460 and Rs 32,610 respectively. Sovereign gold, however, maintained a steady rate, as it was available at rates of Rs 24,900 per 8 gram piece. Similarly, unlike the fall in silver prices, silver coins remained steady and unaltered. The coins are being bought at Rs 76,000 and sold for Rs 77,000 for 100 pieces in the market. Bullion traders across the globe also have their eyes fixed on the US Federal Reserve meeting being held later this week. While interest rates are expected to remain unhinged, the meeting will give a fair idea of the United State’s economic position. Kunal Shah, head of research at the Nirmal Bang Commodities Corporation, spoke about the Fed meeting and mentioned, “There is an expectation of another rate hike from the Fed… But whatever rate hike is going to come has already been priced in gold.” If the interest rates do increase as part of the meeting being held later this week, the higher interest rates will boost the dollar further. This will put immense pressure on gold prices, and further increase the opportunity cost associated with holding non-interest paying bullions. To stay up to date on all things gold, sign up to the goldrate.com newsletter.